State Enterprise (LCR, s. p.) manages most of the state forests (51% of the total). LCP s.p., according to the Czech Government’s decision, is responsible for the implementation of all forestry works (cutting, planting, silviculture, road maintenance) on the basis of long term contracts only with big forestry entrepreneurs. 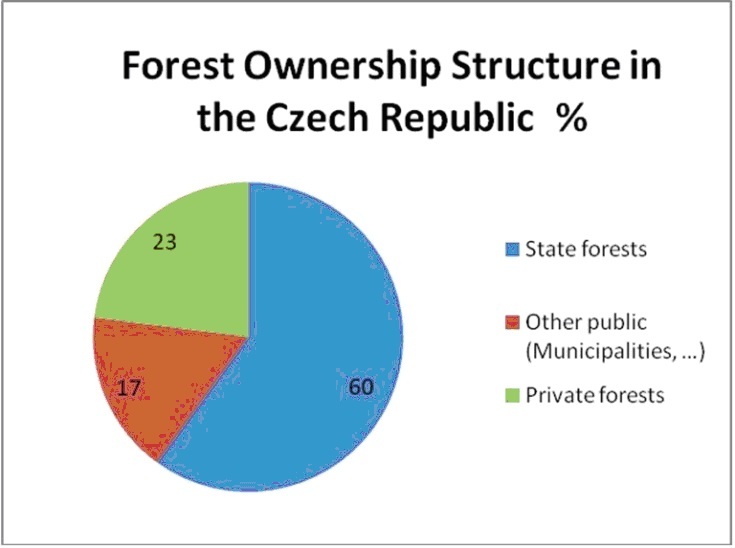 The major non-state forest owners have established a voluntary professional organisation - the Association of Municipal and Private Forest Owners in the Czech Republic (SVOL) which is a very important organization and respected partner of the Ministry of Agriculture, Ministry of Environment and other partners contributing to the development of forest policy in the Czech Republic. SVOL organises seminars and excursions for its members, disseminates on a regular basis professional information for them and also organizes timber sales. According to Forest Law, all Czech forests are accessible to the public (everybody can enter the forest, with his own responsibility). However, there are restrictions regarding access to sensitive areas such as forest nurseries, game reserves, research areas, animals’ natural habitats water springs and Special Protected Areas (SPAs). There can also be temporary restrictions on forest access (e.g. during periods of fire risk, during works in the forest). A Forest management plan (FMP) is obligatory for all forest owners with a forest property over 50 ha. Small forest owners can get forest management guidelines free of charge, or otherwise they follow a forest management policy according to the Forest Act. FMP is very useful to the forest owners including all the necessary guidelines to be followed regarding forest management (afforestation, tending, felling) and it is valid for a period of 10 years.